Buy replica plastic owl bird scarer devices. Fake owl decoys for scaring pigeons and other birds away from your garden or property. Replica plastic owls and fake owl decoys are one of the most commonly used bird scaring devices to scare pigeons and other pest species of birds from their perching and roosting sites, predominantly on buildings in town and city centre environments. 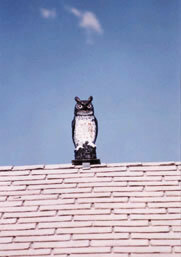 Fake owl decoys are normally mounted on roof areas where the product can be clearly seen by problem birds as they approach their roosting or perching areas. Replica plastic owls are also often sited in key and sensitive areas on buildings where pigeons are causing specific problems. These areas could be canopies in front of shops or railway stations, or possibly architectural features on period properties where pigeons are causing extreme problems as a result of soiling. Bird scarer devices and replica plastic owls, are normally life size models of real owls and stand approximately 12"-23" high depending on which product is chosen and which species of owl is being replicated. The quality of the reproduction varies considerably with some models looking quite life-like and others looking little or nothing like a real owl. A majority of fake plastic owl decoys have no moving parts, although there are now some models on the market like the Rotating Head Owl that move with air currents. Some of the more advanced owl scarers actually move on a rail whilst flapping their wings and making a hooting sound. The principle of using a plastic owl decoy as a bird scarer is to use the pest birds instinctive fear of predators and predation to scare the bird away from its desired roosting, perching or breeding areas. According to manufacturers and distributors claims, the replica plastic owl can be used to scare a wide variety of different species of pest birds in both urban and agricultural environments. The product is completely humane which will have great appeal for those requiring a non-lethal or non-violent product and the fake plastic owl decoy is also relatively inexpensive to buy. Prices for replica plastic owls vary considerably and currently range from £15 through to £25, but the cost is dependent on whether the owl is static (i.e. no moving parts) or whether it has wing, eye or head movement. Some of the more advanced robotic owls cost several hundred pounds and this does not include the cost of installation. "Had pigeons sitting on my fence. The owl worked in that it scared them off but eventually they came back." Fake owl decoys have received a considerable amount of negative publicity in relation to their effectiveness as a bird deterrent and bird scarer, but sales of the product appear to be consistently high. This may be as a result of the fact that the product is extremely inexpensive to buy and if, once installed, it proves to be ineffective the purchaser may feel that complaining to the retailer is a wasted effort. DEFRA’s research clearly suggests that in some cases replica plastic owls can actually attract pest species of birds rather than deter them. DEFR also confirms that the product will only have limited success with some, rather than all species of bird. Where live raptors are flown to deter pest species of birds they are regularly mobbed by the target species, particularly gulls and members of the corvid family (crows, rooks etc). This fact alone suggests that a static plastic owl decoys will have little success in its own right. The owl is a very efficient predator, but it not the natural predator of the gull or the pigeon. In a vast majority of cases plastic owl decoys will be sold to those experiencing problems with these species and as a result the product is likely to fail unless it is provided as part of a comprehensive control system. Even then there is doubt as to whether the fake plastic owl can or will play any useful part. Both DEFRA’s view, and that of the pest control industry, appears to be the same – the product is ineffective in anything but the very short-term. This may be as a result of the fact that a majority of fake plastic owls are static deterrents with no moving parts and therefore birds will become habituated to them extremely quickly. Broadly speaking, any deterrent that does not move or emit any type of sound or noise is likely to be ignored by many of the most common pest species of birds. There are bird scarer devices available that have moving parts such as moving eyes, head and wings, and some that even make a screeching sound as well, but although these products may have some limited success with timid garden birds such as blackbirds, they are unlikely to play any useful part in a control system designed to resolve an entrenched bird-related problem. It is also clear that although claims are made by both distributor and manufacturer alike that replica plastic owls will be effective in deterring a wide variety of pest species of birds, the reality is that the most common pest species (gulls and pigeons) will remain undeterred by this product. The major benefit of this product is that it is inexpensive and relatively simple to install and therefore, if it fails, it can be replaced without too great a loss to the property owner concerned. It should always be understood, however, that there are no ‘quick fixes’ where effective bird management is concerned and if a product or service appears to be ‘too good to be true’, there is a very good chance that it is. Industry standard products such as the anti-roosting spike continue to be the only really effective stand-alone deterrent available to most property owners and in light of this, restricted pest control budgets may be better spent on tried and tested products rather than their ‘quick fix’ counterparts.